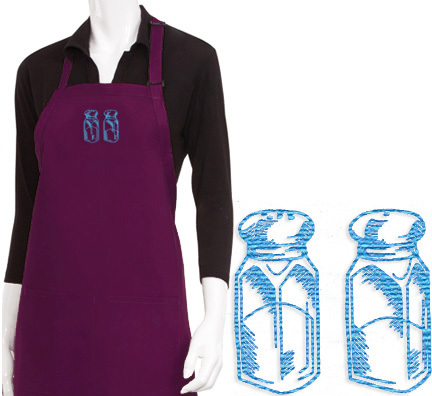 Create a unique Apron with this embroidered Salt and Pepper Shaker logo and transform it into a designer classic. This Teacup design will be embroidered on the bib in the centered position. The color scheme is up to you to choose. We recommend selecting an embroidery thread color that will compliment yet prominently stand out against the fabric color of your Apron. The apron is manufactured in a poly/cotton fabric, treated with soil release technology. The adjustable neck closure allows for a comfortable fit. It is finished with extra-long ties. This apron features a large center-divided patch pocket. This Apron is available in the following colors | Black, Gray, Hunter Green, Lime Green, Merlot, Navy, Orange, Red, Royal Blue, and White. Because this will be a custom piece, created for you based on your color selections, please allow 5-7 business days for logo embroidery plus shipping time. Please understand that once an item has been personalized for you, it may not be returned or exchanged for reasons other than Manufacturer Error or Defect. To ensure you are satisfied with your product, we welcome the opportunity to assist you with questions prior to placing your order.